Architectural drawing of Issaquah’s library, courtesy of project architect’s Bohlin Cywinski Jackson. Issaquah’s 15,000-square-foot library opened June 4, 2001. Just west of the library, along Sunset Way, a new, two-level garage provides free parking for visitors. Construction of the new facility took 18 months and cost about $8.2 million. As of opening day, 28 “state-of-the-art” computers were available for research, writing and recreation. The new building is twice the size of the previous building, which is located next to the Depot at Memorial Field. The old library building will be used as the Issaquah Visitor Center and Chamber of Commerce offices while the Alexander House is being expanded. If a bond issue passes in November 2001, the old library building will be remodeled to become Issaquah’s new senior center. 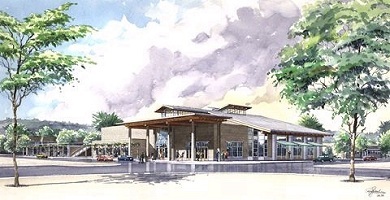 The Issaquah Library represents an expansion and modernization of library services for the Issaquah community in a more prominent and central location. While future downtown planning calls for multi-story urban structures, the library use dictated a single story. The cedar sided structure resolved this apparent conflict through the use of an exaggerated building height coupled with the use of a trellis and canopies to maintain a humane scale at the street level. These scale elements relate to the cornice height of the neighboring buildings and visually secure the building in its context. Patrons approach the entry from the new parking structure, passing screens of greenery and artwork, and from Front Street past large multi-paned windows. On the corner is a large covered area, or agora, which serves as a sheltered gathering space and marks the entrance to the building. Activity in the multi-purpose room, adjacent to the agora, is visible from the streetscape. 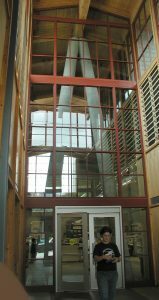 Entering the building from the agora, one passes through a wood-lined lobby and under a pair of tilted columns into the main space. Additional round columns gently taper, accentuating their height, as they rise to meet the wood-line ceiling. Light filters in through the clerestory windows to highlight the delicate metal truss at the spine of the building, and bathe the space in natural light. Custom maple desks and bookcase ends carry the warmth of wood throughout the space. Trellises at the children’s area and circulation desks mimic the exterior trellis. Artwork lines the entrance sequence from exterior to interior drawing one into the building and echoing the sense of discovery inherent in the buildings design. The library is a comfortable cousin to its historical neighbors and creates a fresh identity that is both timeless and welcoming. The lot where the library now stands was known as “Cooper’s Roost” – a lounging corner adjacent to Cooper’s Saloon. 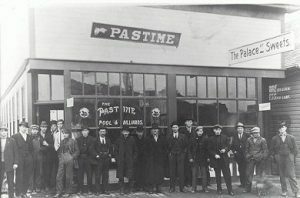 Later the PASTIME Tavern & Sweet Shop was located there, followed by a service station, and, for many years, Union Tavern. The small building facing Front Street that had housed the Union Tavern was repurposed as an Italian Restaurant (Athen’s Pizza) for a year or two before it was demolished in 2000 to make room for the new library. Issaquah’s first literary institution was a reading room organized by Enos Guss, a barber. In 1908 Guss, who had an interest in books and education, set aside a reading room in his shop for patrons and the community at large. The barber shop (and library) was located on Front Street, at the current site of Allen’s Furniture at 131 Front St North just north of old Bank of Issaquah. By 1918 the library had been moved to the Town Hall on Andrews Street (now home of the Gilman Town Hall Museum). Enough books had been donated to fill the shelves allotted to the library in this building. 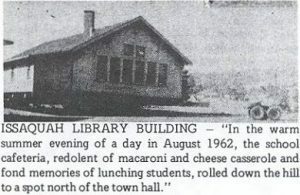 In 1930, when a new Town Hall was built, the library was moved to the City Council Chambers. There was no real community support for a library at that time, so the books remained on the shelves largely unused until the close of WWII. After the war ended, leftover civil defense funds were used to revitalize the library. These funds were used to hire Ruby Lindman, the town’s first librarian. 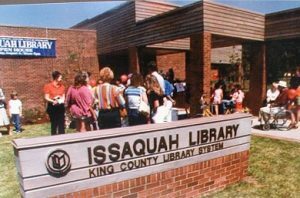 In 1948 the city also signed a contract that made the Issaquah Library part of the King County Community Library System. By 1961 the Library, still housed in the City Council Chambers, consisted of 140 square feet of shelf space. The City was in need of more building space for their own purposes, so the library would have to find a new home. John Fischer, of Fischer’s Meats, donated $680 to the effort. Issaquah’s Library, from “This Was Issaquah,” by Harriet Fish. At this time the Issaquah High School and Issaquah Grade School shared a lunchroom building on “Schoolhouse Hill”. In 1962, since plans called for the new Issaquah Middle School to be constructed on the site, the lunchroom building was moved off the hill and placed on Memorial Field, just north of today’s police station. The library operated in this building, the first dedicated solely to its own use, from 1963 until 1983. This library also hosted historical displays, setting aside a corner for Harriet Fish to display local artifacts. In 1981 the Issaquah City Council voted to build a new library on the northwest corner of Memorial Field, on the site of the old Volunteer Fire Department building. The building was completed in 1983, and was in use until the spring of 2001. Issaquah Library, 1983. The old cafeteria structure was replaced with a new library building. This building was in service until 2001, when a new library opened on Front & Sunset. As of 2015, the old library now serves as Issaquah’s Senior Center.